Multifamily members are encouraged to support this fun, annual program that spotlights your hard-working maintenance professionals! Plan now to participate in the 2019 NAA Maintenance Mania program, hosted by AOBA on Thursday, April 11, 2019, at Martins Crosswinds in Greenbelt, MD. Please note: the Car Check begins at NOON. Spectator Arrival begins at 1:00pm. The Competition begins at 2:00pm, with the Reception and Awards from 5:00 to 7:00pm. Maintenance Mania® is a national competition where maintenance technicians compete against each other in skill-based games built around common maintenance activities. The competition includes a pinewood derby-style car race where the cars are made from maintenance supplies. Nearly 20,000 maintenance technicians have signed up to compete in Maintenance Mania® since the program’s introduction. This fun sports event was developed by the National Apartment Association (NAA) to recognize and celebrate hard-working apartment maintenance professionals. The program allows maintenance staff to show off their expert skills and knowledge, and meet their peers from around the DC region. In this competition, there are CASH and DOOR PRIZES and the chance to win an all-expense-paid trip to the Maintenance Mania National Championships at NAA's Convention held in Denver, Colorado, June 26-28. We look forward to another successful and FUN event!! Please complete this Registration Form for each participant or register on line. Join Us for Training Sessions and Prepare to Win! To prepare, your maintenance professionals are encouraged to participate in a complimentary, pre-event Practice Sessions on March 22 from 8:00am to Noon and April 5 from 8:00am to 4:00pm. All sessions will be held at SERVPRO of Rockville, 850 E. Gude Drive in Rockville, and RSVP is not required. Please download this 2019 Sponsor Opportunities flyer for details! Questions? Contact Jeanne Clarke at jclarke@aoba-metro.org. New this year – a lip sync competition. Enter your team in this new fun competition. The first eight teams to sign up will be in the challenge. You can have no less than three people on your team and bring a CD with your song of choice which is to be one minute in length. Click here for Lip Sync Registration. Still not sure if you're ready to enter? Watch this 2016 video to witness the excitement that you've missed! 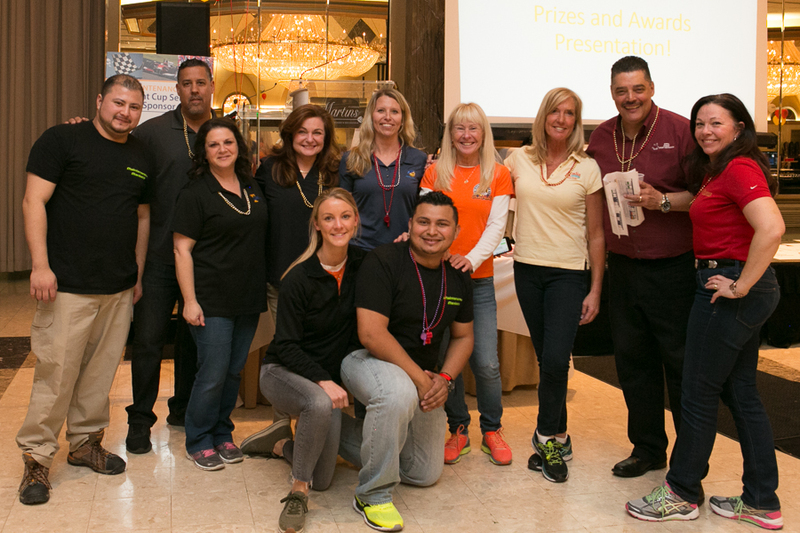 At the 2018 NAA Maintenance Mania held March 14, over 100 local maintenance staff from 11 member firms competed in games that highlight multifamily maintenance professionals. In addition, approximately 125 “Spectators” provided enthusiastic support for their company teams. Top prize at the 2018 competition went to Pedro Martinez with Kettler Management. Other 2018 winners were Rachid Chabraoui and Jamie Lopez also of Kettler Management (pictured below). Registration for all AOBA events is handled online only. Please remember that to receive the Member Rate for AOBA events, you need to take a moment to set up your personal online profile - and include your shipping address so you can receive INSIDE, our printed bi-monthly newsletter. And if your company is an AOBA member, you are automatically a member! Questions? Please email Pascha Steward.